Vichien is a socially active corporate leader from Thailand. Having dedicated much of his time over the past two decades to serve social causes, Vichien has nurtured numerous initiatives that seek to engage citizen participation in solving public issues. He founded three foundations to tackle inequality and to create change in Thai Society, focusing on the future of education, active citizenship and environmental protection. He is also a prominent contributor to public institutions such as Anti-Corruption Organization of Thailand, where he serves as the Vice-Chairperson. Vichien is a co-founder of the BKIND Fund, Thailand’s first socially responsible investment mutual fund which invests in Thai-listed companies that meet sustainability targets. 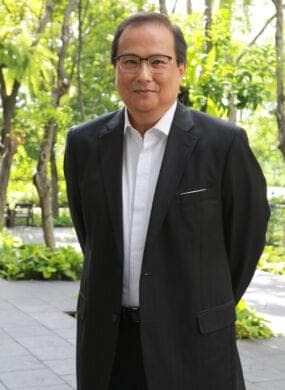 He helped to establish the Thai CG Fund, a collaboration of the Federation of Thai Capital Market Organization (FETCO), 11 asset management companies, Khon Thai Foundation, Thailand Development Research Institute and the Change Venture Co., Ltd. The Thai CG Fund seeks to establish a mutual fund which only invests in companies demonstrating good corporate governance. He also sponsors Thailand’s most active online social crowdfunding platform - “Tae Jai” which aims to harness contributions from society in order to fund and scale up community-based projects in Thailand. Vichien has also established the Thailand Collaboration for Change (TCFC), a platform that seeks to mobilise funds, expertise and volunteers to create multipliers on social projects for large scale collective impacts. Currently, TCFC is working closely with partners to improve standards of education in schools throughout Thailand, prevent corruption through increased transparency in public life, and promote the inclusion of disabled people in jobs market.